A boy watches clouds of steam beneath the undercarriage at England's North Yorkshire Moors Railway train at Pickering Station. The train conductor kindly agreed to pose for a photograph. 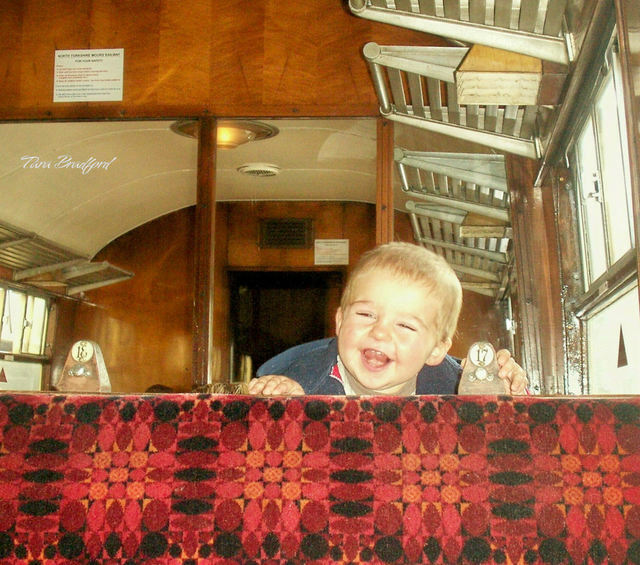 On the return journey, this adorable little boy played "peek-a-boo" with me. A train arrives at Pickering Station, the hub of the railway. The North Yorkshire Moors Railway first opened in 1836 as the Whitby and Pickering Railway. It was designed by George Stephenson to open trade routes inland from the coastal town of Whitby. Initially, the railway was intended for horse-drawn carriages. In 1845, the railway was acquired by the York and North Midland Railway and the line was re-engineered for steam locomotives. Permanent train stations and other structures along the line were built, which remain operational today. Hogwart Express scenes from a Harry Potter movie were filmed at Goathland Station. The hills surrounding the station are covered with thick clumps of heather. A station sign at Pickering, next to the Porter's office. Baskets of flowers hang from iron lanterns at Pickering Station. Large carts store weather-beaten vintage luggage. A trio of freshly-painted enamel fire buckets, reminiscent of the 1920s,hang from hooks at the train station. Vintage enamel advertising signs adorn a station fence at Pickering. A vintage sign advertising the famous Yorkshire Relish. Puffs of smoke escape from a train arriving at Grosmont. The steam train pulls into the station. 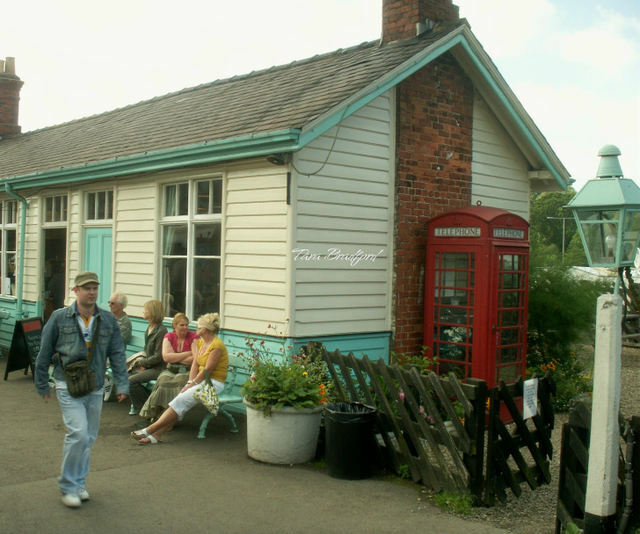 An old train car has been converted into a local railway office, midway along the 18-mile route.